This is a photograph I took in Nikel, Russia. If you take a look at my colour work, you see that I usually take landscape images that most would consider "beautiful". In this collection the image about the factory in Nikel stands out for various reasons. What did I actually photograph here? I do live near Kirkenes in Sør-Varanger municipality, the only area in Norway which shares a border with Russia. Just a short travel across the border, Nikel is the nearest town on the russian side. It is possible to see the factory from the norwegian side in the Pasvik valley, south of Kirkenes. The nickel industry there is according to my knowledge the main source of income for the region. While this has created jobs and income for many people living there, it has also created environmental problems. When you visit Nikel in summer, you will see that the nature in the area surrounding Nikel seems to be dead. Black tree stumps are a common sight. What interested me in this image was the ambivalence of this situation. It portrays industry which contributes economically to this region and it's future, but at the same time threatens the future because of it's environmental side effects. The sight of industry like this is usually considered ugly by most, but in this case it also has an aesthetical interesting side for me. 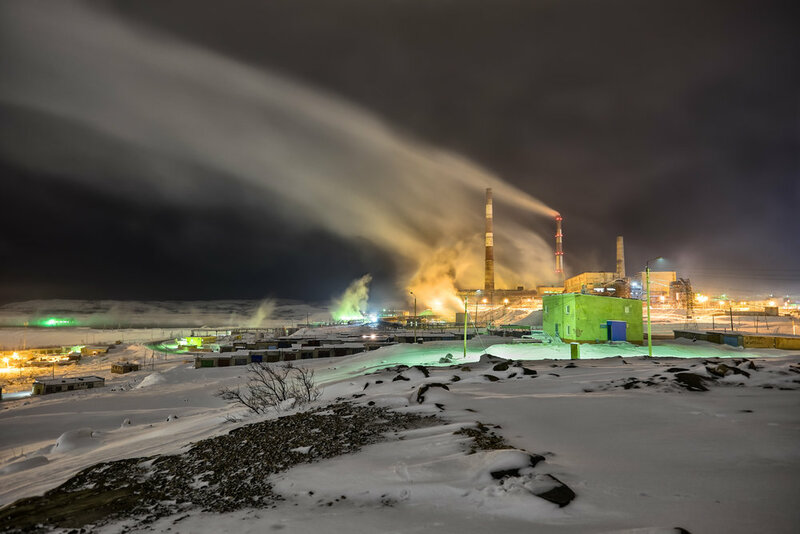 The factory surround by these orange and sickly green lights, creating huge amount of smoke while situated in this winter landscape make this image look almost otherworldly. It is for me a symbol of the struggle between industrial progress and the conservation of nature. It also shows how humans can transform landscapes. The british group White Lies also filmed a music video for Farewell To The Fairground in Nikel. For a glimpse of Nikel, see the video below. If you want to visit Nikel yourself, you can for example do a day trip from Kirkenes (you need to get a visa some time in advance). To be fair, Nikel is more than just this factory. If you visit Kirkenes on the norwegian side, a trip to Nikel can be an interesting contrast culturally. And if you have even more time, I recommend a trip to Murmansk, which is only a few hours travel by car or bus from Kirkenes. You can also follow me on on my Facebook page or Instagram for updates.